It may officially be spring but the weather is still cold and windy. That means there's still plenty of time to make a warm pot of soup. 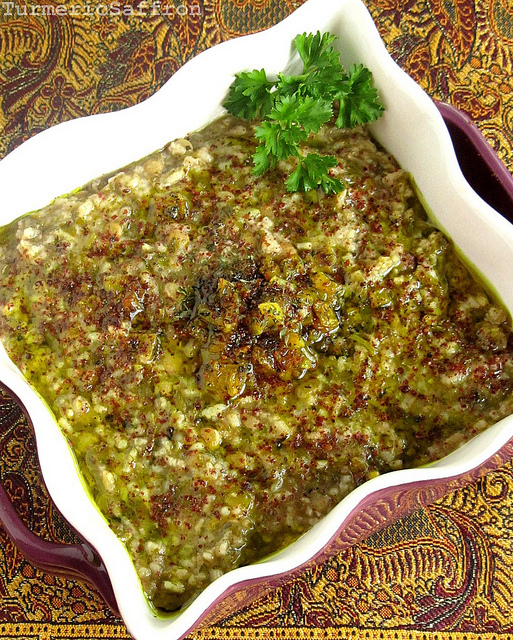 This is also a good opportunity for me to use the recipe that inspired me in the only Iranian cookbook that I own! This cookbook was given to me by mother when I left home many years ago and is called "Noosh-e Jan Konid" (Bon Appetit), by Mansoureh Amir Ebrahimi, which was published in Tehran. I don't know much about khanoum Amir Ebrahimi; in the introduction she writes that she had a cooking radio show called "Zan O Zendegi" (Woman and Life) and she decided after ten years to turn the recipes from her radio program into a cookbook. That's perhaps the reason why my mother found out and chose this book for me to take on my long journey abroad. Sometimes, a gift will last you a lifetime! I can imagine her listening to Mrs. Amir Ebrahimi's program in the morning while tidying up our rooms, rearranging furniture and preparing lunch. Well, for many years I had no use for a cookbook, I basically lived on cafeteria food, fruits, yogurt and bread. I kept the book in a box with the rest of the books and magazines that I accumulated over the years. I re-discovered it during my recent spring cleaning and decided to pay tribute to this less well-known author and her cookbook. I have searched her name on the Internet but unfortunately I have not been able to find much information on her. I am becoming increasingly passionate about preserving what's been good in the past and to pass it along. 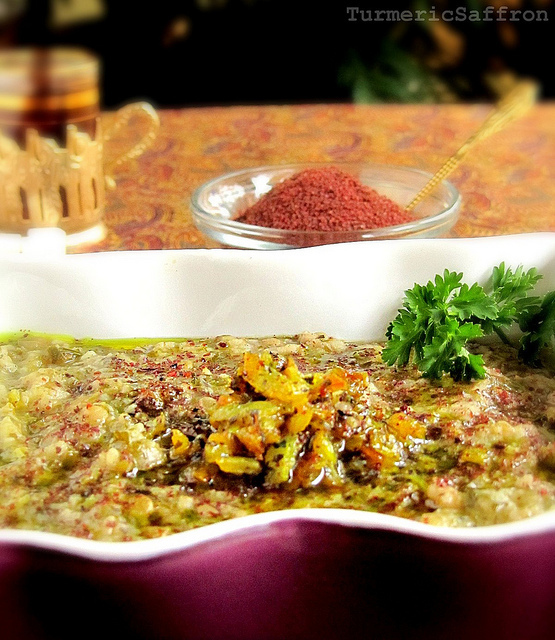 I chose آش سماق ash-e somagh recipe to highlight because it's rich, creamy, comforting and delicious. However, I made a few changes. The original recipe calls for small meatballs but I decided to make a vegetarian soup with lentils instead. If you prefer, you can add meatballs to the soup. The recipe also calls for either rice flour or small broken rice to reduce the cooking time and perhaps to make the texture more smooth and creamy. I used basmati rice and it turned out well. Also, since the amount of ingredients recommended in the recipe were more than what I usually make for our family of four I decided to cut down the amount of rice, herbs and sumac. 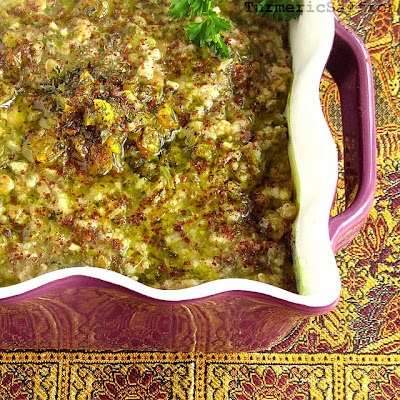 Finally, I served ash-e somagh with the usual caramelized onion, garlic and mint topping. Sumac gives this soup a subtle tangy taste. Sumac is mostly sprinkled on kabab dishes for extra flavorings. Growing up, sumac was always on the table alongside salt and pepper. Put the rice in a large stew pot, add 8 cups of water, bring to a boil on medium-high heat. Then lower heat to medium-low and cook for 10 minutes, stirring occasionally. Pour in the lentils, stir well, cover and cook for 30 minutes. Add water if necessary. Always add hot water to the stew that's cooking on the stove. Cool water will interrupt the simmering/boiling process. Stir in the chopped herbs into the soup. Add salt and pepper to taste and let it simmer on low heat for another 10 minutes. You may drain sumac in a very fine mesh strainer and add the liquid into the soup as suggested in the book or pour in the soaked sumac and all liquid and cook for another 10-15 minutes. Taste and adjust the seasoning to your liking. In the meantime, saute onions in hot oil. When golden brown, add turmeric, stir well, mix in the garlic and mint, and saute for another 5 minutes on medium heat. Add some of the fried onion mixture into the soup, stir well and save the rest for garnish. Ladle the soup into a serving bowl, garnish with fried onion and drizzle some of its oil, sprinkle a little bit of sumac and serve with warm lavash and yogurt. Ash-e somagh may be served hot or cold. * For ash-e somagh with meatballs, combine a pound of ground meat (lamb, beef or turkey), salt, pepper, a handful of chopped herbs, 1 small grated onion, one egg, 1 tablespoon of flour, mix well. Make tiny meatballs, brown on all sides in hot vegetable oil and add to the soup half way through cooking. my three favorite persian cookbooks are "food of life" and "in a persian kitchen" and "persian cuisine: traditional,regional, and modern foods". i love buying persian cookbooks and have a nice collection, but only in english. it is nice to see some variations in recipes AND compare them with the tradtional persian cooks. i like to mix and match and make my own style. thanks for this recipe, i had never heard of it before! It is a little windier than I had hoped! But this looks to be a perfect solution! ooh..wow,perfect for sunday brunch.. look tasty and healty. One of the reasons I love your blog so much is because of the rare Persian recipes you post. I love all kinds of soups and ashes and can't wait to give this recipe a try. can i cancel the lentils ?? 1. I have dried sumak, how much should I use? 2. What can I substitute terragon with? I ever find it fresh here. @Bent El Deera, I used lentils as a replacement for meatballs, you can leave them out. Thanks for visiting. @The Bird Cage, Thanks so much for your kind words. You'll need: 3-4 tablespoons dried sumac. You can leave out the tarragon and use a few fresh basil leaves instead. Thanks for all the great recipes. I am trying Haleem right now for the first time. @Anonymous, Thanks for visiting my blog and your kind words. Amir is a popular name for men. However, in this case the name "Amir" is part of the last name of the author and her first name is Mansoureh which is a name for women. Sumac is one of my favourite spices (or is it more a herb?) and I canàt wait to try this soup. Also substituting lentils for meatballs makeds it not only healthier but also quicker and easier. Hi Azita! What an intriguing recipe, I'd never heard of it. Which region of Iran is it from? I'm going to make it tonight, and had a question: what type of lentil did you use in this recipe and did you pre-soak it? Hi Azarakhsh, I'm so glad you like this recipe. I used brown lentils. There is no need to pre-soak lentils. They cook quickly. The Bird Cage, I'm so glad that you and your guests enjoyed the stew! Salam Azita joon, I tried this recipe and it was simply divine. Ash-reshteh might soon be replaced as my comfort-in-a-bowl! Thanks Azarakhsh jan, I'm so glad you enjoyed this recipe! This is a wonderful soup recipe that I am bookmarking; we make a lot of lentil dishes in Lebanese cuisine, but I have never made one with sumac. Completely off the subject........back when I was a boy, in the 40s or 50s, there was a popular South American singer who went well beyond a normal vocal range.....so she was marketed as an Aztec under the name, YMA SUMAC. Her real name was AMY CAMUS of Brooklyn, New York. At the time I found it hilarious. I was just discussing Iraqi food with a butcher in a supermarket here in Beirut and he asked me if I had tried ash; he said it was delicious but was very vague in describing it. so glad I found it in your blog! I am finding out that Iraqis have adopted a lot of Persian dishes, as i was talking to an Iraqi friend and she mentioned making all these well-known Persian dishes. I am wondering if this is a new development now! This ash sounds really good and I'm going to make it for shab-e-yalda instead of ash-e-reshteh. But I don't know what do yo mean by 1 bunch! Different stores sell herbs in different sizes. Would you please tell me 1 bunch is how many cups or pounds or grams? Hi CoRoNa, I've made the necessary adjustments to this recipe. Happy shab-e yalda and I hope you enjoy the recipe! Thank you! I love visiting your blog and test your recipes. Mansooreh or as I called her Mansoir Joon was my mother's aunt. She was a very talented lady and full of love. Naghmeh jan, thanks so much for visiting my blog and taking the time to leave me such a sweet comment. 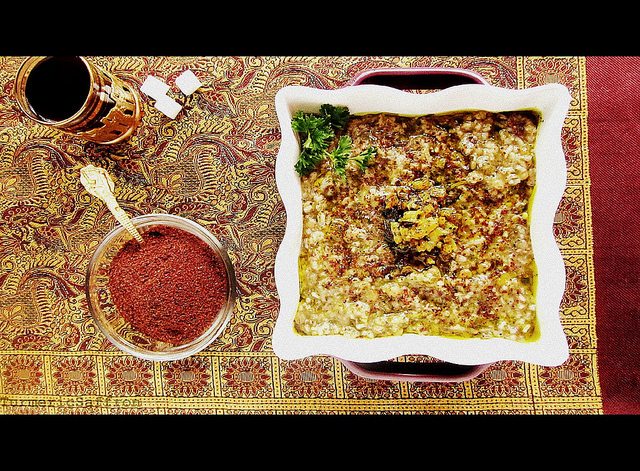 Have you thought about translating Mansooreh Khanoum's cookbook and getting it published?